Welcome to Market Update Q4 2017. The fourth update of 2017, giving you an up-to-date view of the office, investment & development market west of the West End. Included in this issue: Earls Court master plan, office supply, current rents, Hammersmith Town Hall consultation and our Annual Review for West London. In Q4 2017 office take-up in Hammersmith & Fulham this year was 409,000 sq ft, double the total for 2016 (201,000 sq ft). WeWork, the co-working company leased 98,000 sq ft of this supply. At about ¼ of the total take-up it could be argued that this space is still available to the office market but on a co-working, flexible basis. This quarter WeWork leased 45,000 sq ft from Dunnhumby at 184 Shepherd’s Bush Road in addition to the 53,000 sq ft ground to 3rd floors of 12 Hammersmith Grove W6. All Nippon Airways also took space at 12 Hammersmith Grove and Perform Group took another floor, taking the 5th in addition to the 6th and part 7th. The rents range from £55.50 to £56.50 per sq ft. Another co-working company, Spaces (which is owned by Regus) took the 17,000 sq ft Garment Building which has just been refurbished by Frost Meadowcroft client, Sunley and Red Grouse. Following the launch of Helical’s refurbished Power Road Studios in Chiswick, Frost Meadowcroft let 5,900 sq ft to Stem Marketing and 2,500 sq ft to Intelligent Media for £43 per sq ft.
Victoria Beckham leased the 15,000 sq ft building 202 Hammersmith Road at a rent of £58.50 per sq ft for the best space in the building and Jellycat relocated from the Shepherd’s Building to 8,000 sq ft at the part 1st floor West Works, White City for £49.50 per sq ft this quarter. The White Company also moved to White City, taking 32,240 sq ft 6th floor at 2 Television Centre. Berkeley St George took 5,000 sq ft at The Aircraft Factory in Ravenscourt Park for £57.50 per sq ft and Vosaio Travel took 2,777 sq ft at The Clockwork Building, also at Ravenscourt Park for £53.50 per sq ft.
Fever Tree took an assignment of MIH Jeans former building at Jasmine Studios next to Hammersmith Fire Station in Shepherd’s Bush Road. At The Point, next to the canal in Paddington Basin, W2 3 new lettings totalling 52,596 sq ft completed in Q4. Addison Lee, the taxi and car service moved its HQ to the 22,987 sq ft 4th floor, another transport company, First Group took the 18,125 sq ft 8th floor and Mitsubishi Hitachi Power Systems, the power generator, took 11,484 sq ft on the 3rd floor. The headline rent was £60 per sq ft for the larger lettings and £62 per sq ft for the part 3rd floor. Despite good take-up this year supply in Hammersmith & Fulham remains quite high at 10.9%. This is due to the launch of the new 114,500 sq ft Foundry, the central building at Assembly London, 77 Fulham Palace Road, Hammersmith, 230,000 sq ft at White City TV Centre 2, 210,000 sq ft at The West Works and 120,000 sq ft at The MediaWorks. This level of supply however is lower than the supply peak of Q2 2016 at 14.5% . 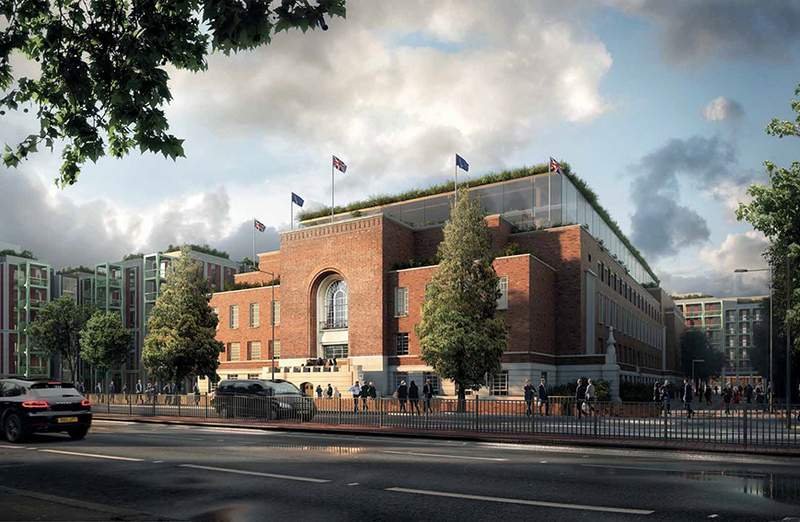 Discussions between developer Capco and Hammersmith and Fulham Council could see architect,Terry Farrell and Partners , overhauling its masterplan for Earl’s Court. In 2012 the council and neighbouring Kensington & Chelsea gave planning permission for the practice’s original masterplan which contained proposals for 7,500 new homes. Capco confirmed that it was discussing new proposals with Hammersmith and Fulham, which has sought to increase the amount of affordable housing included in the scheme. The exact shape of the masterplan will be influenced by mayor Sadiq Khan’s decision on whether to grant a request by Capco to increase the number of homes included in the Earl’s Court Opportunity Area to 10,000. The news of a potential revision to the Earl’s Court plans comes after Hammersmith and Fulham Council leader Steve Cowan, in a letter to residents, said any new planning application could see the council regain ownership of two council estates, West Kensington & Gibbs Green that were previously sold to Capco. His regime, elected in 2014, has severely criticised the original plans for failing to provide replacement, like-for-like homes for council tenants on these estates. In Q1 2017 Capco had stated that the Earl’s Court scheme had reduced in value by 20% from £1.4 billion in 2016 to £1.1 billion at the end of 2016. This is likely to have influenced their desire to alter the masterplan along with the campaign by many residents to keep the council estates. The London Borough of Hammersmith & Fulham began its public consultation on a new scheme for the redevelopment of the 1970’s extension to the Town Hall that fronts the western section of King Street, near Ravenscourt Park station. The Council have a new development partner, A2Dominion, one of the larger London housing associations who have instructed architects Rogers, Stirk & Partners. The consultation proposes the demolition of the 1970’s extension and the restoration and extension of the original Town Hall building behind it. There is a new public square in front with office, residential, cafes and shops in new buildings surrounding the square. There will also be a cinema replacing the old Cineworld cinema that has already been demolished, the land it previously sat on forming part of the scheme. Q1 – There were early signs that the office rental market was improving after the Brexit-induced slowdown in the last 2 quarters of 2016. Medidata took the top 2 floors of 12 Hammersmith Grove at £59 per sq ft which equalled the record rent paid in Hammersmith and Firefly and Lee Cooper Jeans took more space at The Aircraft Factory. Office supply was at an historic high in Hammersmith and Fulham and Chiswick throughout the year so available space had to be pristine to be let and rent free periods increased as tenants had much greater choice. Q3 – WeWork took the ground to 3rd floors at 12 Hammersmith Grove and it looked as though this building and The Aircraft Factory would be fully let by the end of 2017. However office supply remained at 13% in the Borough as AXA and Bell Hammer launched the 114,500 sq ft Foundry Building. This is the central building of their Assembly scheme which has Alex Chinneck’s surrealist installation on the front, looking like the building has been torn like a book. Q4 – WeWork leased another 45,000 sq ft from Dunnhumby at the 1915 built Old Ford Factory Building at 184 Shepherd’s Bush Road in Brook Green, Hammersmith and The White Company took 32,240 sq ft 6th floor at 2 Television Centre. These lettings contributed towards doubling the take-up in Hammersmith and Fulham from 201,000 sq ft in 2016 to 409,000 sq ft in 2017. 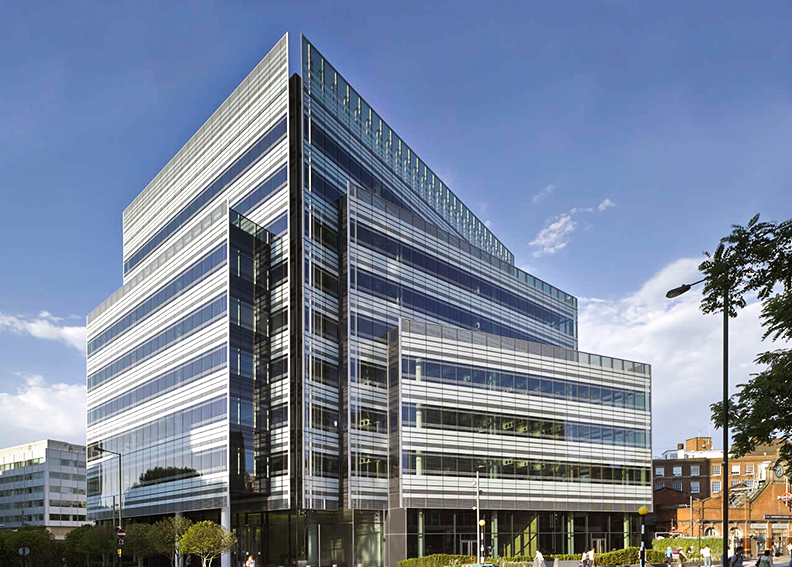 The Q3 sale of 10 Hammersmith Grove to Blue Horizon Investments was the third sale of this investment in 12 months. The sales began just after Brexit with Aberdeen Asset Management having to sell as some of their investors, fearing slumping commercial property values, prompted a rush of withdrawals, which forced them to freeze trading and sell off assets to fund them. Aberdeen Asset Management put two buildings up for sale with a £100m price tag and sold 10 Hammersmith Grove to Brockton Capital for £83m. By November 2016 Brockton Capital sold on to Hong Kong investor, Tai United Holdings for £103.5m. Ten months later, with 12 Hammersmith Grove letting for between £55 and £59.50 per sq ft, the average rents of £47 per sq ft at 10 Hammersmith Grove were proven to be reversionary and so Blue Horizon Investments were confident enough to pay £112m (£933 per sq ft) a yield of 5.33%.